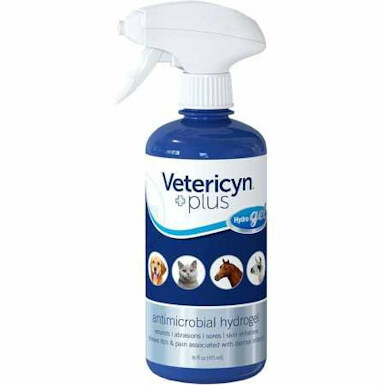 Vetericyn Plus Antimicrobial HydroGel (16 Ounce with pump) is a thicker get form of the original Vetericyn Wound Care liquid product. HydroGel clings to uneven surfaces and stays in place longer. Vetericyn HydroGel cleans, treats and heals wounds. It will not harm healthy tissue and it is effectively kills antibiotic resistant strains of bacteria, fungi, viruses and spores. It is Safe and Non-Toxic for use around eyes, nose and the mouth of all species of animals. Vetericyn Plus HydroGel does not contain any Alcohol, Steroids or Antibiotics.